Indicast was started as a “let’s put spare time to good use” project back in 2005 and since then the fun hasn’t stopped. 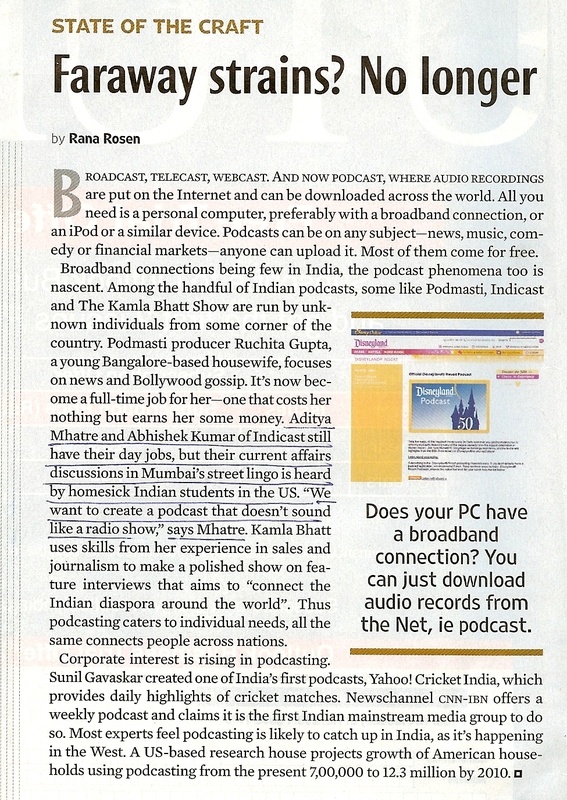 From a single current affairs news show, Indicast has grown into a network of 5 podcasts shows based various other themes like business, technology, bollywood movie reviews and an interview show. All Podcasts on Indicast Podcast Network as available free of cost for on-line streaming on our website, various podcast directories and even on your mobile phone. We highly recommend you to subscribe our show for free on iTunes or other RSS feeds to get automatic updates of our show releases. The secret behind the popularity all Indicast shows is its presentation style and freshness of content. You can also expect a few lighter moments while we navigate the topics on all our shows. Winner of “Best Podcast” at IndiBloggies. Interviewed by print media publications like Economic Times, HT, Mid-Day, Outlook and many more.